Ork poser, Problem Children member, invited Ivan and others to party at his families place (middle class-he appears to be slumming it). His whole family appears to be ork posers. 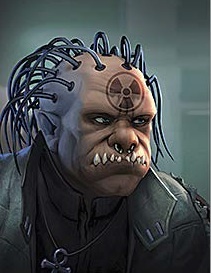 He was outed at the party, and a huge fight broke out, as the real orks there didn’t like that he was faking it. Ivan and Remus hightailed it out of there, and later heard he was arrested. He has since made bail and is still running low level PC errands. Lig’s partner. He snitched the team out to the Black Shadows, resulting in Halfman ambushing the team’s bank hesit job, and very nearly killing everyone. Ivan is currently plotting his revenge. Believed deceased by the team.